Get started for freeNo credit card required. Beautifully crafted, the workspace is where the action happens. 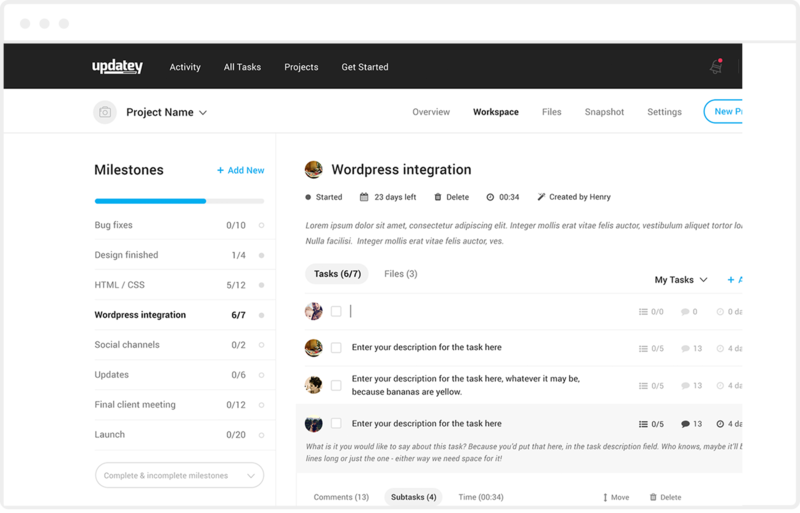 Get to work with tasks, subtasks, comments, assigning tasks to your team, sharing files and more. Powerful project management done right. Provide a big-picture view of your project, so you and your team are always aware of the long-term goals, next steps and areas that need focusing on next. Keeping clients, stakeholders and other non-technical parties up to date on the progress of your project used to be a case of giving them access to your full blown project management environment. Things can get messy quickly when you start doing this. Snapshot reports put you in the driving seat. Send them out to your clients weekly, or leave them in ‘live’ mode. It’s up to you! Comment on tasks to help flesh out details and clarify objectives. 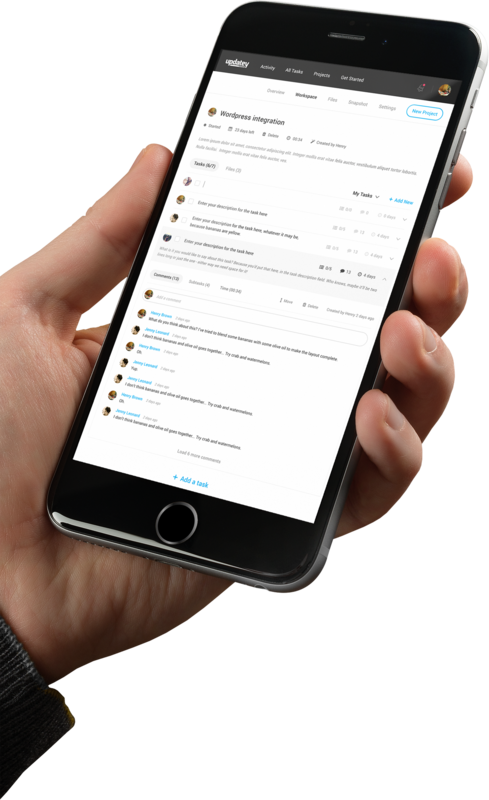 Share files, screenshots, designs and thoughts with your team easily and quickly. For when larger tasks need more detail or when a task just needs that extra bit of thought and structure. 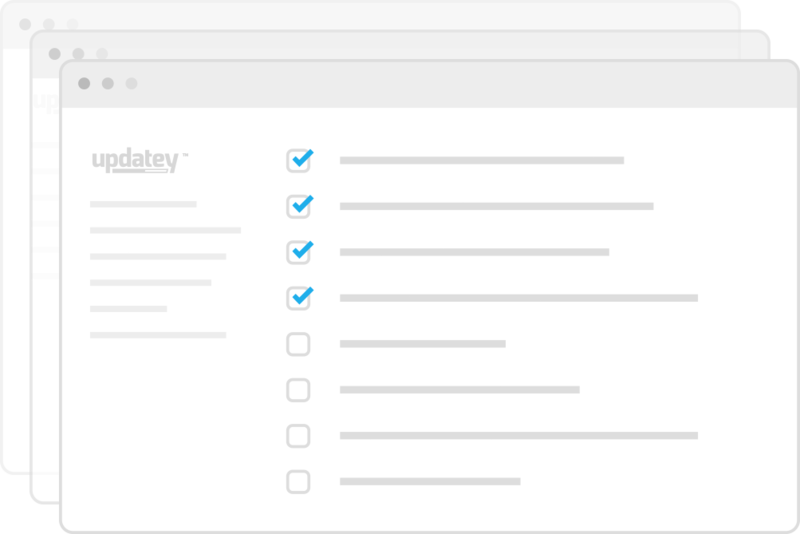 Adding subtasks helps you stay in control of what needs to be delivered. Never loose track of that screenshot, design mock-up or document again. Browse or drag and drop files into your tasks for easy access by your team. Keep everyone on the same page by centralising key project notes. Perfect for sharing setup instructions, high-level client briefs or extended descriptions of the project. From time to time your project may require you to keep track of time spent. Updatey makes this easy to achieve for both you and the rest of your team.